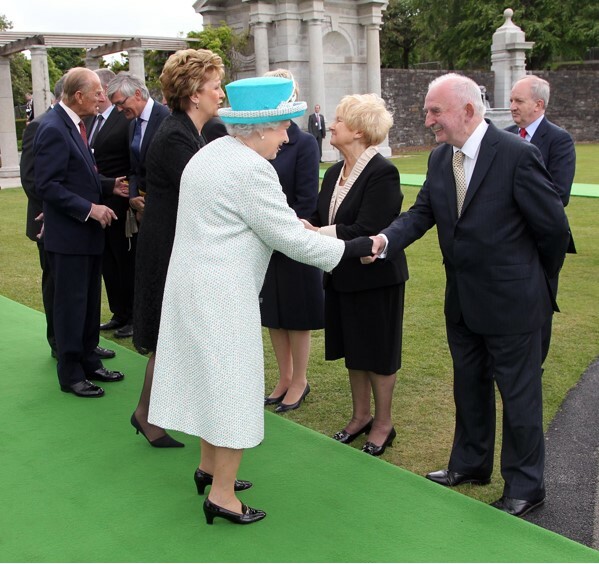 On Wednesday 18 May 2010, as Chairman of the Somme Association Dr Ian Adamson OBE was in Dublin as a guest of the Government of the Republic of Ireland, where he was presented to the Queen by President Mary McAleese.. Both unionist and nationalist politicians from Northern Ireland were among those present when The Queen honoured tens of thousands of Irishmen who died in the First World War. At a commemoration steeped in symbolism, Her Majesty laid a poppy wreath at the Irish National War Memorial Gardens in tribute to the almost 50,000 soldiers who died in the Great War. President Mary Mc Aleese then laid a twin wreath. The ceremony at the gardens in Islandbridge, a site which fell into disrepair during the turbulent 1970s but has since been fully restored, seemed to symbolise the improved relationship between Britain and Ireland.